Discollate - program for optimization of placing information on electronic carriers (CD, DVD, etc.). Discollate becomes the good assistant for those people, who often writes various data on disks with fixed capacity. It will help to allocate information intended for record more effectively, saving carriers (eg, CD or DVD disk) and time. Discollate can work with folders and separate files, calculating the most felicitous combination for the greatest possible filling of the carrier, and showing result in the visual form. -Work with folders and separate files. -Possibility to set capacity and count of carriers. 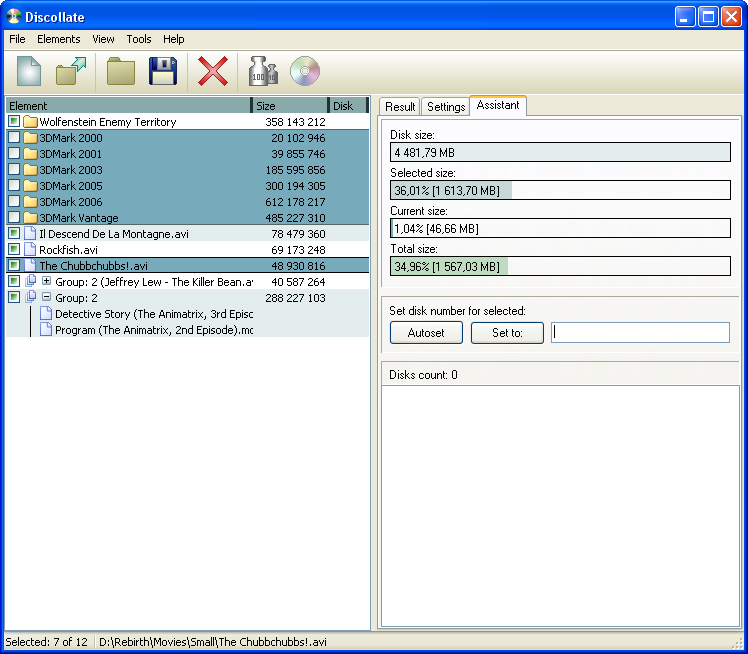 -Possibility to collate data in manual or automatic mode. -Visual assitant for manual mode. -The simple and handy interface. If you have any questions, suggestions or comments, or you find an error, then report it on the forum!